Promising. Successful. Bright. That is exactly what the future of the American economy looked like up until a few months ago. It seemed like every month we were making leaps in the job market with more and more people gaining jobs. The stock market was running high, especially when compared to where it was at the end of 2008. Disappointing. Scary. Bleak. That is where we stand now. With the job creation in the United States slowing down and over one hundred thousand layoffs expected in government jobs in the next few months, the future of the American economy is not looking good. Add to that the recent drop in the stock market and it is hard not to think that we are potentially in some serious trouble. Friday, the stock market took a huge hit. For the first time since March, the Dow Jones ended a day under 12,000 points. To add to the damage, the Nasdaq fell so hard that all of the gains it previously made in 2011 are now gone. In other areas of the stock market, silver and oil both decreased by just under three percent on Friday. Financial and insurance stocks led the way in the fall, but banks were able to improve things just a little bit towards the closing bell. However, with the surge of the bank stocks, the Dow Jones still fell 172 points to 11,952 points. The drop was a total of 1.4 percentage points. The biggest losers of the day were Travelers, Allstate, MetLife, and Principal Financial. The losses are partially being blamed on the recent storms in the South and Midwest. 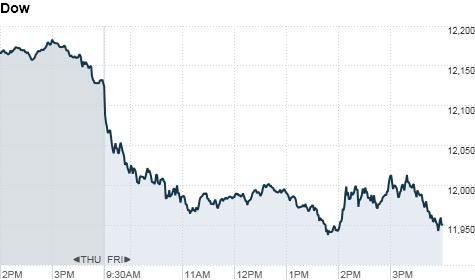 The S&P 500 also fell a total of 1.4 percent. It dropped a total of eighteen points to 1,271 points. The Nasdaq fell even harder with a 1.5 percent drop. It was a total of 41 points. The Nasdaq finished at 2,644 points, essentially making the previous gains in 2011 nonexistent. For the sixth week in a row, the Dow Jones and the S&P 500 saw dramatic decreases. The economy seems to never be stable in the United States. Every time it appears that we are making a comeback, we run into a major slump. Every time it seems we are going on a downward spiral, we hit an upward surge. At the end of the day, it is hard to tell if this is the end of the fall or the beginning of a much larger crisis.